– Petra Cliffs Climbing Center & Mountaineering School focuses on climbing and mountain-related education and recreation, accessible to all ages and abilities. We seek to offer premium instruction and services through experience-based education, uncompromising attention to safety and customer satisfaction, growth with empowered employees, and an inspiring atmosphere for families and friends to gather for challenge and fun. 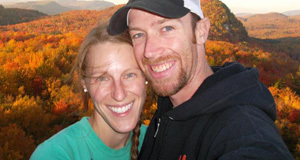 Andrea began working part-time at Petra Cliffs in May 2002 after being a regular climbing customer while attending UVM. Birthday party crew, SumMAT Camp leader, team building facilitator, Junior Climbing Team coach, indoor instructor, SumMAT Camp Director, and outdoor guide (AMGA SPI)… Andrea loves having worked with every facet of Petra Cliffs. She is proud to have grown a successful summer camp as Director since 2009, to have a thriving climbing community, and to have met so many amazing employees & customers throughout the decade at Petra Cliffs. As Head Guide, Steve has grown the Outdoor Programs from a few outings per season to abundant work with many of the local colleges, climbers looking to improve their skills (including the development of a ski mountaineering trip to Valdez, Alaska), and beginners seeking out new challenges and landscapes. Steve has improved the level of professionalism at Petra Cliffs by requiring all indoor instructors and outdoor guides to become AMGA certified in the level at which they instruct, and to continue their own professional development. Steve is a certified AMGA SPI, and is on his way to becoming a fully IFMGA certified guide. He is very active with the American Institute for Avalanche Research and Education (AIARE) and is a Level 1 and 2 Instructor.